Lifefactory creates innovative, non-toxic products that make it easy to lead a healthy and eco-conscious lifestyle. They fuse modern sensibility and composition, also exceptional utility to produce a glass beverage bottle that is free of known harmful chemicals such as BPA, phthalate, PVC, and polycarbonate. All materials are FDA approved. The unique patent pending silicone sleeve is free of plastics, 100-Percent non-toxic, provides a great gripping surface and helps prevent breakage. The benefit of using a glass beverage bottle is that there is no risk of chemicals leaching into your drink and no metallic taste. Reusable as a snack or juice container, perfect for lunch boxes. 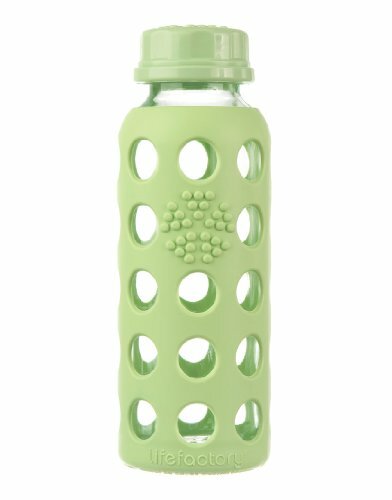 Beverage bottles are easy clean and dishwasher safe (the glass bottle and silicone sleeve can also be washed together in the dishwasher). Each bottle holds 9 -ounce (260ml) and measures 6.75 x 2-Inch. Available in 4 great colors!